Baader Planetarium 2" Herschel Safety Wedge Solar Prism - Version "V"
The Baader Herschel Safety Wedge Solar Prism provides the best white light solar views obtainable! For use with refractor telescopes only. Version "V" is for visual use. The Baader Herschel Safety Wedge Solar Prism is superior in resolution and contrast to the best glass objective filters around. 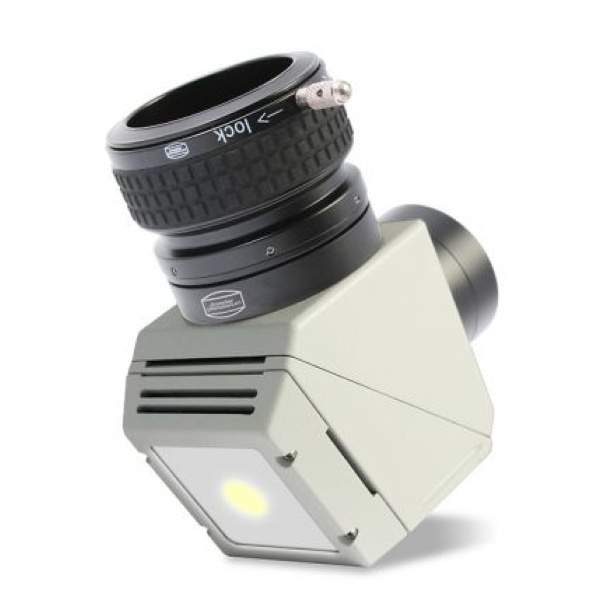 Provides a true white-light view, does not filter any visual wavelengths. The The Baader Herschel Safety Wedge Solar Prism uses precision 2" Zeiss wedge prism, and incorporates a permanently pre-installed ND=3.0 filter in the wedge housing. Waste energy is sent through Baader's innovative Light Trap. 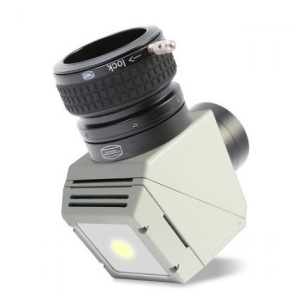 The latest version incorporates an innovative Light Trap developed by Baader Planetarium. This development takes the Herschel Wedge into the 21st Century, by rendering the output energy cool and diffused! In all other herschel designs, the waste energy is simply deflected out of the rear face of the prism by an angled mirror. Though quite safe with careful use, the user still had to be aware not to place any object (or body part..) into this output beam (and to prevent any casual onlooker from carelessly staring up into the beam). Thanks to Baader Planetarium, this concern has now been completely removed. In place of the typical output mirror is a coated multi-layered perforated steel screen. The bright light and heat energy are harmlessly diffused. Even after prolonged observations through large refractors, the light trap remains cool. You can even place a hand below the output and no heat can be felt (also, no tempting or hazardous bright output for careless eyes to see). Baader now offers two versions of the Herschel Wedge: The Version-V (visual, sold separately) comes with the pre-installed ND=3.0/1:1000 (required for safe viewing), and a 2" Continuum Filter. The Version-P (photographic, included in this package) starts with the Version-V and adds 3 additional Baader ND filters (ND1.8/1:64, ND0.9/1:8, ND0.6/1:4 ). The additional ND filters are handy for further dimming the image for white light viewing, or attaching to eyepieces or a T2-15 Reducer, and are particularly useful for imaging. All of the fine-optically polished genuine Baader ND filters now incorporate special anti-reflection multi-coatings to further eliminate light scatter and ghosting for maximum image contrast. The result is image quality unachievable with any other ND filter.